TheLEADERToyota's market share rose to nearly 25 percent in August after ranging around only 21 percent for months. There were 926 units of the Toyota Fortuner sold in August 2018. According to the August sales report of Vietnam Automobile Manufacturers' Association (VAMA), sales of the whole Vietnamese automobile market reached 20,504 units last month, four per cent lower than the previous month and seven per cent lower than the figure for August 2017. Notably, there were 5,629 imported automobiles handed over to customers last month, up 66 per cent from July 2018. Meanwhile, domestically assembeled automobiles achieved the sales of 14,875 units, 18 per cent lower than the previous month. The two largest players in the market continue to be Toyota and Truong Hai Automobile (Thaco). However, the market share of Thaco reduced significantly to only 32.3 per cent from the level of over 40 per cent for months. According to VAMA, Thaco's sales also dropped sharply by 17 per cent. By contrast, after five consecutive months of keeping the market share at around 21 per cent and sometimes falling sharply to less than 20 per cent, Toyota recorded an increase of 11 per cent in its output and 3,3 per cent of market share last month. Previously, its market share was maintained thanks to such domestically manufactured vehicles as Camry, Corolla Altis, Vios, and Innova. 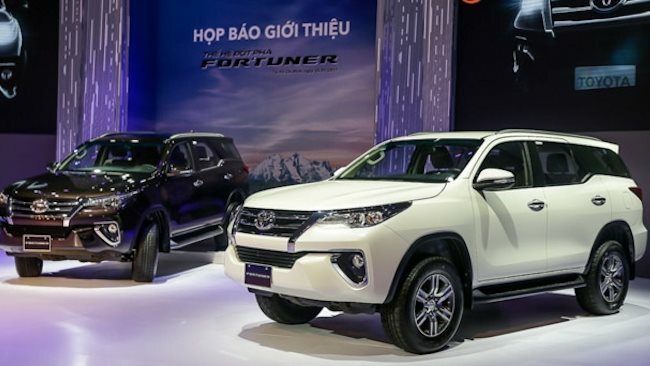 Till last month, Fortuner, Toyota’s most popular car which used to be the best seller of Toyota, was seen in the list of vehicles sold with 926 units after exactly five months. This number helped this model of Toyota become the fifth best seller on the market. Overall, although there are signs of a strong return of imported cars after a long time facing obstacles related to the regulations in Decree No. 116, the sales volume of this kind in the first eight months of this year was still just over a half of domestically assembled automobiles' sales. By the end of August 2017, total sales of the whole market decreased by five per cent compared to the same period last year. In particular, sales of domestic assembled vehicles increased by ten per cent while imported ones decreased by up to 41 per cent.